Personal Details: Bluey was the youngest son of William John Homewood, known as John, and Martha Emma Homewood (nee Hill), who had eleven children. Following the death of his mother when Bluey was just two, the family moved down to Drury, south of Auckland. Bluey attended Drury School, but at the age of 12 he left home and school to become a farm labourer. His first job was on a farm near Drury owned by the grandfather of today's TradeMe owner and well known economist Gareth Morgan. Bluey loved it there but aft a couple of years the Morgans shifted away and he got another job down the road at a different farm. This place was not so good, and at around the age of 15 he walked out, with the intention of becoming a swagman. However his old schoolmate Bill Darwin met him on the road and talked him out of this, and the Darwin family took him in as part of their family. Service Details: At the time in the mid to late 1930's when many young men were joining theTerritorial Army, Bluey's mate Bill Darwin suggested they should apply for the Territorial Air Force instead. Bill''s main reason was he thought the blue uniform would be more attractive the the sheilas. 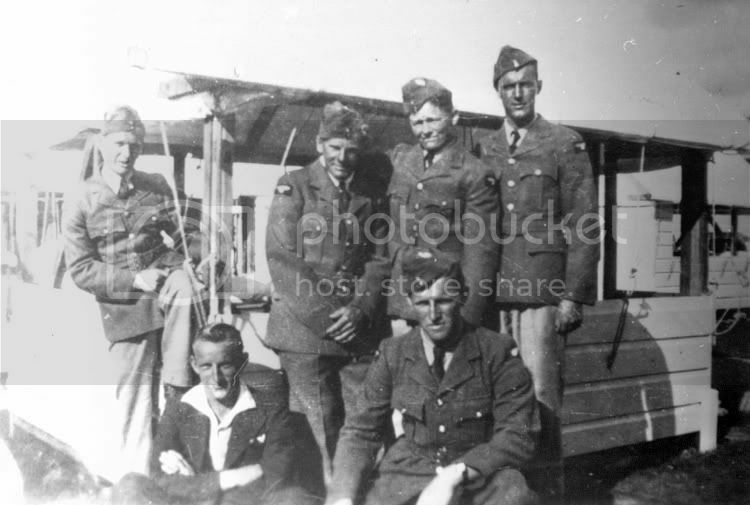 They sent in application forms but never heard anything more from the RNZAF till just after the war broke out in 1939, when Bluey, then working for Sharlands and Co in Auckland, was called up for RNZAF service. After a period of waiting, and then an RNZAF medical where they decided he should have his tonsils out, Bluey spent two weeks in Hospital in December 1939. Then the Christmas and New Year break held him up further, and finally he was taken in on a basic course in February 1940, at RNZAF Station Levin, at Wereroa. Bluey's service records for his RNZAF service were purged in 1948-49 so sadly little detail of this time remains. However he was supposed to train as a Wireless Operator-Air Gunner. Though he completed his basic course at Levin there was no WOp/AG course available yet for Bluey to go onto, so he was kept at Levin for a while simply awaiting orders. The highight of this time for him was being selected to march in the funeral cortege for the Prime Minister Michael Joseph Savage, who'd died on the 27th of March 1940. Shortly afterwards Bluey was posted to Wigram, which infuriated him as he'd still had no training and all he wanted to do was go to the war, yet Wigram was further away from the war than Levin was. On arrival he was placed into the Stores there, and was employed stacking boxes. He was also given night duties, pushing aircraft around the tarmac and helping with refueling during night flying training. Frustration was growing at not being given a place on a course, and almost daily he would visit the station Headquarters to aks the station disciplinarian, Warrant Officer James "The Bull" Duncan (later a Squadron Leader) when he was being posted to his course. This invoked the rage of The Bull who would tell him to get back to work and stop making trouble. Eventually Bluey's patience ran out. Whilst on a day off on the 15th of May 1940 he was walking through the Cathedral Square at Christchurch when he spotted an Army recruitment office. He decided to ask if he could sign on, and the Army said yes. A few days later the paperwork filtered through to the RNZAF and The Bull tore a strip of Bluey for signing onto the Army, but there was nothing he could do about it, and the RNZAF had to let him go. So Bluey joined the Army, entering camp at Trentham in June 1940. Following a quick training there he nearly got onto a ship with the Third Echelon of the 2NZEF, however it was then the Army discovered that he'd put his age up when he'd signed on, claiming he was born in 1918 rather than 1921. So he was manpowered into the Reid Rubber Company working a lathe making rings for preserving jars. On the 26th of August 1942 he once again entered camp with the Army at Auckland, and went through a long period of training at Narrow Neck, Hillcrest, Papakura, Patanui, Haywards, Paikakariki and Trentham before finally embarking aboard the Aquitania for the Middle East on the 5th of Januay 1943. So his plan in 1940 to speed up his passage to the war had not really worked. After universal carrier training at Maadi Camp in Egypt, Bluey joined 21 Battalion at Tripoli. He went through the battles at Medenine and the Mareth Line, Starvation Hill at Takrouna, and the move towards Tunis before the desert war ended. Returning to Maadi he was selected for a British Commando Course at the Canal Zone which was very tough and grueling but he loved it. He then embarked on the desert road march from Maadi to Burj Al Arab, and boarded the New Amsterdam for Taranto, Italy. In the Italian campaign Bluey went right through all the major engagements the Battalion saw, from the Sangro River and the Orsogna Road, to Cassino where he took the first german prisoner taken by the Allies. He was also in the centre of the battle at Hotel des Roses in Cassino township where he was wounded. Later battles that stick in his mind include fighting at the Rubicon, coming under friendly fire from US P-47D Thunderbolts at the Po River, and the entry into Trieste among many other skirmishes. He rose to the rank of 2nd Lieutenant in the Army. After the war Bluey was granted a farm by the Government at Bruntwood, Cambridge. Once he'd settled in there he rejoined the Army as a 2nd Lieutenant Territorial Officer and served from May 1951 as infantry in the Territorial Army, and then from April 1953 through till April 1954 as part of the Cambridge-based artillery unit, the 5th Light Regiment, RNZA. Connection with Cambridge: Bluey moved to Bruntwood, Cambridge, in the early 1950's when he was granted a farm from the Government. he lived there for several years before moving to Paihia for many years, and then settling in retirement in Whangarei. He is the great-uncle of the website owner Dave Homewood. Above: Bluey at RNZAF Station Levin during his Air Force Initial Training Wing days. He is standing second from the right in the back row. Note the mix of uniforms and civilian clothing, perhaps this is the day they were issued their uniforms.